The footage shows a group of people desperately trying to pull the crazed canine away from its victim. Several witnesses repeatedly kick the animal and one even sprays what appears to be pepper spray in the creature's eyes, but still it holds its bite. 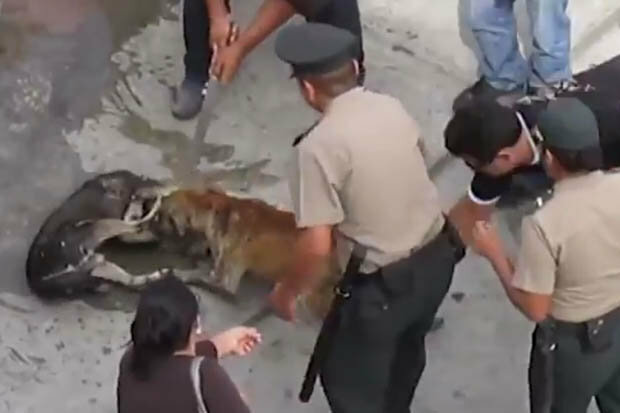 The video, filmed in the Peruvian town of Chimbote last week, later shows a police officer using a Taser on the PIT BULL but with no success. 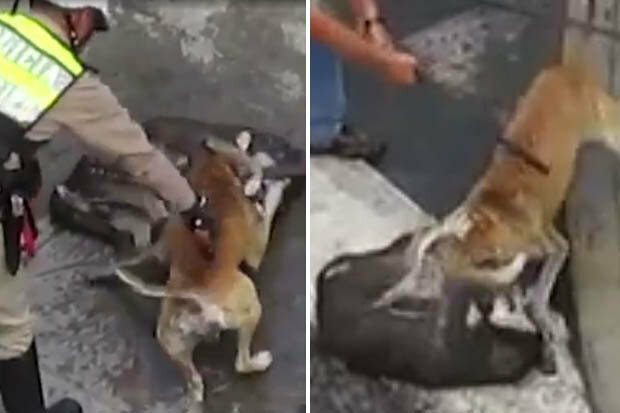 Again failing to release the canine from its vicious grip, police pull its legs and tail, dragging the helpless dog along in the process. 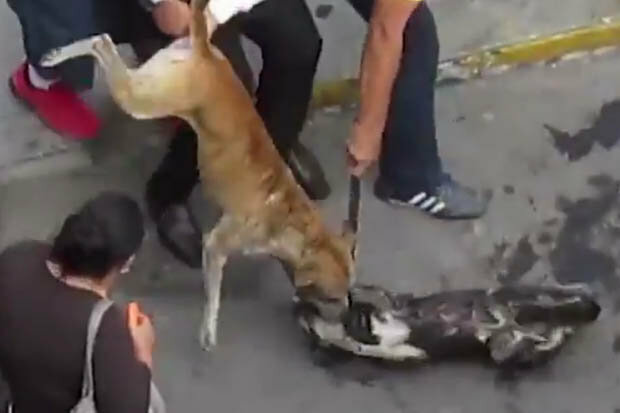 Onlookers continue to pummel the pitbull with batons and handbags as the smaller creature is dragged helplessly around like a rag doll. Eventually, one woman manages to rescue the poor pooch from the pitbull's vicious grasp. Please tell me the pit died. Well, I watched this video. It automatically started playing. Toward the end, I noticed my muscles were tight. Seeing this pisses me off so much. It's just a bite! Pit bulls are just like regular dogs! The pit bull was trained to fight! Its never acted aggressive before! My kids play with it all the time! My pit bull will lick you to death! Did you know pit bulls are nanny dogs? I just adopted this pit bull two weeks ago! Do we really need dog fighting dogs as pets?